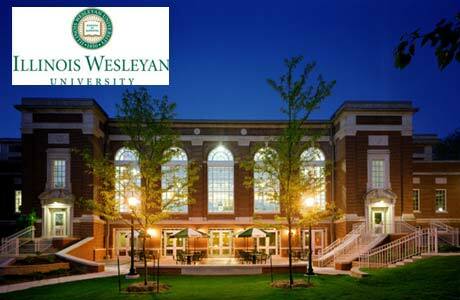 Illinois Wesleyan University is an independent undergraduate liberal arts college located in Bloomington, Illinois. Founded in 1850, the central portion of the present campus was acquired in 1854 with the first building erected in 1856. It comprises 17 academic departments offering 50 majors and 476 courses. Merit-based scholarships are offered to qualified international applicants with outstanding academic achievement and test scores on the required entrance exams. These awards range from $10,000 to $25,000 per year and are renewable for up to four years. In some instances, additional help is provided through student loans and campus employment. In addition, two full-tuition President’s International Student Scholarshipsmay be offered. These scholarships may be awarded each year to two highly qualified international students, based on their talents, interests and academic achievements.The President's scholarship is renewable for up to four years of study at Illinois Wesleyan University. For international applicants seeking additional financial assistance, we highly recommend submitting the CSS Profile. The Profile provides a detailed analysis of each applicant's financial resources. Using this information, we can be “need sensitive” when considering ways to further assist our international students with Illinois Wesleyan University funded scholarships, loans and campus employment opportunities. The preferred deadline to submit the CSS Profile is April 1.